Where to Play Ninja Chef for Real Money? There are plenty of slots out there focused on ninjas, and just as many using food as their main theme. But combining both together? Well, that really is pretty unusual to see in the world of online slots (although Ninja Fruits by Play’n Go is similar)! This slot really isn’t just about a gimmicky theme though, as it offers far more to players than that, meaning that this is one of the better online slots you’ll find at casinos. The first thing to mention is that the graphics are absolutely stunning, and have been created superbly by iSoftBet. Most of the pieces of food seen on the reels are sushi, however you’ll also see the odd prawn spin by. Of course, there are also ninjas as well – the aspect of the slot that most will find exciting. The main job of the ninjas is to decimate fruit, much in the way they did on a certain highly popular mobile app a few years back. The sounds also add a lot to the overall feel of this slot, unlike at other slots, where they can be both distracting and incredibly annoying. So, all in all, there’s really nothing to complain about when it comes to the theme at Ninja Chef. How to Play Ninja Chef Casino Game? 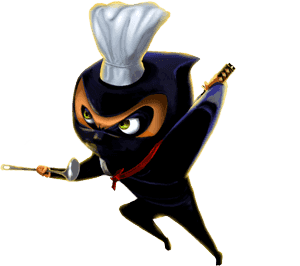 The main thing to say about Ninja Chef is this: it is incredibly fun to play. This aspect of fun is often forgotten about with slots, as developers instead look to cram in as many features as possible, or focus too much on prizes. But isn’t enjoyment what playing slots is all about? Of course, it does offer substance to match the style though, thanks to a jackpot worth up to 300,000 coins, which is pretty massive when compared to some other games out there. Of course, only the luckiest will win this amount though, however other players should still expect to see some significant prizes, especially during the free spins. To get the game started, first choose how many of the 30 paylines you want to play, and then choose how much to bet on them. With a minimum overall bet of 0.10 coins and a maximum of 10, this is a slot that caters for all levels of players. Then you can spin the reels and watch the beautiful graphics do their thing, before finding out if you’ve been lucky enough to win big. All in all, the gameplay at Ninja Chef is incredibly simple, however this should certainly be seen as a plus to the game. Bonuses form a big part of the gameplay at Ninja Chef, however they aren’t so important as to make the base game irrelevant. The first important symbol to watch out for is the one with an explosion on it, as this is the wild symbol at Ninja Chef. The best thing about them is that they come with multipliers, which enhance wins significantly. What’s more, a multiplier can actually enhance another multiplier. For example, if you got a 2x and a 3x in a combination, the total multiplier would be 6x. There’s also a scatter symbol at this slot, and it is represented by the Ninja Chef logo. Unusually for a slot, the scatter is just that – a scatter. It doesn’t do anything else, such as start a bonus round. So, it’s only use is when it spins in three times anywhere on the reels. •	Salmon Sushi. Slicing through this symbol will lead to five free spins, with a multiplier of 6x added to them. •	Steak. Slicing three pieces of steak will reward you with eight free spins, and all wins will have a 3x multiplier attached to them. •	Blowfish. Slicing through three blowfish will lead to 15 free spins, however these will have no multiplier added to them at all. What’s more, all of the different free spins options can see one or more expanded wild symbols appear on the reels, which can lead to some impressive wins.